… then The Stretch Zone will enable you to unlock your potential – when it really matters! A frequent concern is that confidence is limited to only certain types of personalities to the exclusion of others. So people hold themselves back, believing they just haven’t got it. This is a fundamental mistake. Confidence is an imminent potential for EVERYONE regardless of personality, it just looks and sounds different – and difference does not mean absence. The Stretch Zone is unique and different as it does not go down the well worn path of confidence boosting hype – wasting effort and energy unnecessarily. Instead The Stretch Zone inspires us to channel our efforts and energy to where they matter most – releasing real and authentic confidence from within – anywhere, anytime. 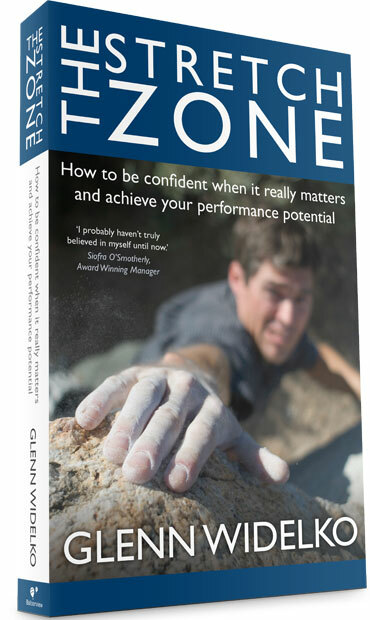 Based on Glenn Widelko’s new book, the Stretch Zone Workshop provides a unique and in-depth insight into what confidence really is (and isn’t) – enabling real and sustainable confidence when it really matters. The Stretch Zone e-Course is an easy-to-use online e-learning opportunity that will introduce you to a whole new way of thinking – turning outdated assumptions about confidence completely on their head. The Stretch Zone Self- Assessment is an easy-to-use, online self-assessment that enables insight into how you tend to react under pressure in the stretch zone – and how to respond differently. Enter your name and email below and you can download the first six chapters free. All fields marked * are required. Subscribe to free Stretch Zone newsletter? You will be able to unsubscribe from our newsletter at any time, and your details will be held in strict confidence.